"You never expect a bear to have a rap sheet, but he does." 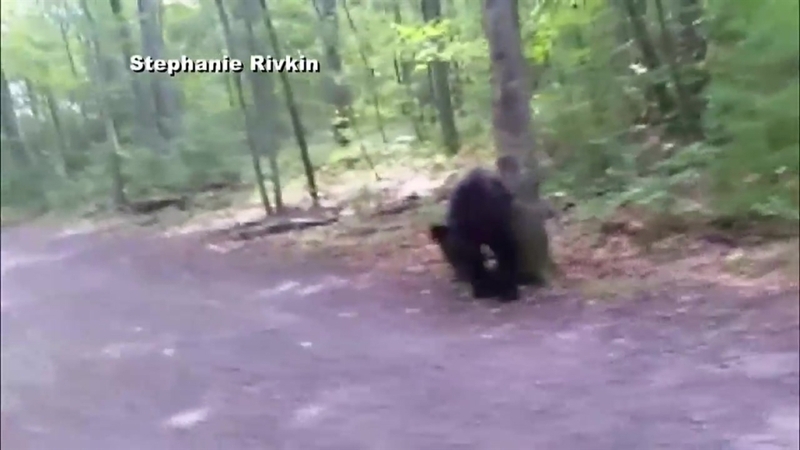 The black bear that prompted state officials to block off hiking trails in Connecticut last week after it was caught on camera circling a hiker has a history of aggression, according to the state Department of Energy and Environmental Protection. The bear, which is tagged, caused problems in the past while living near Bradley International Airport in Hartford, according to DEEP wildlife biologist Jason Hawley. DEEP crews relocated the bear to Enders State Forest after the incident at the airport. At one point, the animal chased a woman into her workplace and put its paws up against the glass, Hawley said. The bear also forced its way into a home in Granby, pounding on the door until he got inside. Hiker Stephanie Rivkin captured footage of the animal approaching and circling her on a walking trail Friday. Video shows the bear opening its mouth as if to bite her leg. "You never expect a bear to have a rap sheet, but he does," said Rivkin. The incident prompted state officials to close down the hiking trails while they searched for the animal. DEEP announced plans to euthanize the bear, prompting public backlash, but officials said the animal is dangerous and the move is warranted. "The incident here at Sessions Woods was far more disturbing than any of the other behaviors he has displayed up to this point," said Hawley. "To someone who’s not familiar with bear behavior, it may look like the bear is curious. Maybe it’s just trying to get a good sniff of the person." Hawley went on to say, however, that the animal was displaying clear signs of aggression. "If you look at the actual body language of the bear, the bear is actually circling her. Whenever she turns her back on the bear, it actually rushes her. You can hear it several times popping its teeth, popping its jaw; that’s a sign of aggression," he explained. "Its hackles are up; the hair on its back is actually sticking up. It actually pins its ears back a couple of times." Hawley said the animal’s track record is concerning. "In our minds, with our training, we know that this bear is a potential threat to public safety, so there’s no question that we need to remove this bear from the population," Hawley said. He added that some 600 to 700 bears live in Connecticut, and "removing one from the population doesn't change anything." In fact, he said, euthanizing the animal could help protect bears' reputation by preventing an attack. Rivkin, who first said she hoped the bear could be saved as thousands signed petitions to halt euthanization plans, explained Monday she understands the state’s rationale. "They’re making the decision for a reason, and after having heard the reason, I kind of want to be neutral," she said. "I’m kind of 'spare the bear' at the moment and I’m also 'spare the other people and hikers that may be in danger also.'" Rivkin said she and her family have received threats on social media in the days since her story went public. She's asking people not to blame her for the bear's fate. "Anyone who knows me, anyone on social media who has my back knows me, and I’m an animal lover. I’m a nature lover and no, I don’t want the bear killed," she said. "I want him to be relocated but apparently that’s already been done, so they’re taking the steps to do what’s right for everybody, the bear population, the people population."